An over the ear hearing aid is one of many options that you can choose from. It can be stressful trying to find the right hearing aid for you when it is not something you particularly wanted in the first place. There’s a variety of different styles to accommodate your personal needs and desires. The ones that seem most commonly known are the ones that fit directly inside of you ear. However, another very common type of aid is the over the ear hearing aid. Here Is what you need to know about over the ear hearing aids. When you decide you want over the ear hearing aids, your decision goes one step further. There is the Behind the Ear(BTE) aid which is placed behind your ear but has a small tube that connects it to an ear mold that sits in the ear canal. The other kind is referred to as a Receiver in the Ear device (RITE) and is similar to the BTE but is connected with a wire rather than a tube. This makes the RITE aid a little smaller than the BTE, which can be more convenient for some. These types of hearing aids are suitable for all age groups and cater to pretty much any kind of hearing loss. They typically offer greater sound amplification than most In the Ear hearing aids. They also can hold a larger sized hearing aid battery which will increase the lifespan of your aid. In the Ear hearing aids tend to be very noticeable. 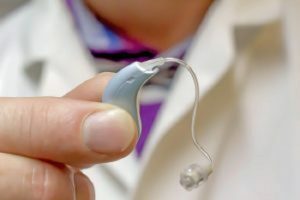 Over the ear hearing aids are more concealed and they now offer mini versions to give them an even more discreet look. This is also one of the cheaper options out of the others, so if you are looking for cost-efficiency while also maintaining nice quality, this is a good option for you. The benefits definitely outweigh the drawbacks when it comes to over the ear hearing aids, but it is still good to consider them. Because of the positioning of the microphone, these hearing aids are prone to picking up background wind noise. The RITE versions of these aids can sometimes become blocked by earwax because of how thin the wire is that attaches it. It is important to clean your hearing aid out regularly if you go in this direction. Let Bay Area Audiology Provide The Best Hearing Aid For You! This entry was posted on Wednesday, February 21st, 2018 at 5:26 pm. Both comments and pings are currently closed.